Sensitive information, such as trade secrets or ideas for new inventions, must be kept and protected in order to preserve the proprietary nature of that information. A non-disclosure agreement (NDA), also called a confidentiality agreement, is a way to protect this information. Essentially, an NDA is a contract whereby each party agrees to keep the secret. Identify each party in the first section of the form. The NDA form will start by declaring it to be an agreement and identifying who the agreement is between. Whoever is disclosing the information to be protected is the "disclosing party"; write his or her name on this space. The receiving party (the person getting the information and protecting it) is the "Receiving Party"; write his or her name on that appropriate line. 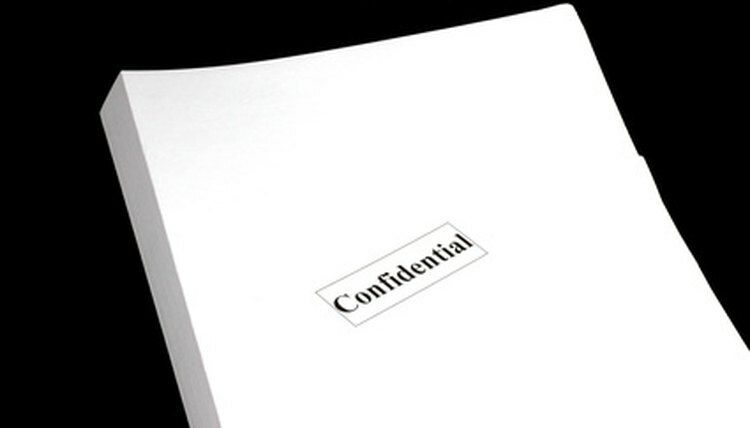 Check the definition of "confidential information." Many NDA forms will come with "stock" language that defines what is meant by "confidential information." This definition may or may not meet your specific requirements. If the definition does not meet your expectations, add a line at the end of the definition section such as "See Appendix A." Attach appendix A written to encompass what the parties intend to be "confidential information." Repeat Step 2 in the remaining sections on the form. Read each form and amend each section with an appendix if the language does not meet the parties expectations. For instance, in the "obligations of receiving party" section, if an agreed-upon obligation is not listed in that section, it must be listed in an appendix or it will not be considered part of the contract. Sign and date the NDA form on the signature lines provided at the end of the form. Lawrence, George. "How to Fill in an NDA Form." , https://legalbeagle.com/6081835-fill-nda-form.html. Accessed 19 April 2019.